Kanan and Ezra seem to be back in the swing of things, but can the two work together to save the rest of the crew of the Ghost from an old nemesis? Has Ezra really given up his desire to use the secrets of the Sith holocron? Can Kanan’s new inner balance be enough to make him a formidable Jedi and valuable mentor? For me, Maul works. I know there exist those who do not like the fact a character who appeared to die in a movie was brought back in the Clone Wars, and is now a major part of Rebels. I like him here for two reasons. First, his powers are formidable, similar to Darth Vader’s and Count Dooku’s. All three held the position of apprentice to Darth Sidious. This makes him a very powerful adversary, one which causes us to actually worry about the safety of our heroes. Second, while it is great to see Darth Vader mix it up with our team, his fate is known. Although he had a close call against Ahsoka, the outcome was never in doubt. As it is, there exists the real question whether Kanan or Ezra will kill Maul, or if he will kill one or both of them. Maul’s motivation also works well. We know he has been betrayed or hurt by almost every faction in the galaxy. Revenge against Sith and Jedi alike is very believable. What seems out of place is what he, and for that matter Ezra, say they are searching for. The Jedi’s quest is for the destruction of the Sith. While the former Sith and still dark force user says he is looking for hope. His answer sounds uplifting, but I suspect he is looking for hope that he can find a way to exact revenge on at least one of those who have defeated him in the past. A clue as to the identity of that person may be given when Maul says, “He lives,” after staring into the light of the joined holocrons. He is probably not surprised that Sidious is still alive. In fact, he is well aware that his former master is the Emperor. He may be surprised the young boy he was supposed to kill while he was still Sidious’s apprentice is alive, but only if he did not already know that the child became Darth Vader. This is still unlikely to be who he means. He must mean Obi-Wan, who has been hiding for almost two decades and who Maul wants to destroy. I also like the interaction between Kanan and Ezra. There is still an uneasiness present. Ezra finally apologizes for what happened to Kanan. Kanan tells Ezra it wasn’t his fault, and that he should forgive himself. We also see that Ezra probably sees himself as superior to Kanan. Ezra doesn’t want Kanan to go into the cave with the spiders because he believes Kanan can’t take care of himself. When Kanan uses the force to make a spider leave them alone in the cave, Ezra says in disbelief that he himself is unable to do that. Only after Kanan later tells other spiders to go in peace does Ezra begin to listen to his opinions about how to proceed. The actions of the rest of the crew are good, although only a minor plot point. Clearly, they are in over their heads with Maul, but they still refuse to give up. They form a good plan to escape, but Maul is better. They at least prove that outside the realm of force users, they are a more than capable cell in the rebellion. The actions of the Bendu still give me trouble. I love the idea of a creature between the light and the dark. That is where most of us reside. However, his actions still seem to be on the light side. He seems worried about the chaos that could be caused if a dark user gets both a light and a dark holocron. He seems less concerned what would happen if Ezra or Kanan use both holocrons, only warning them that what is seen cannot be unseen. At one point the Bendu does say, “Perhaps master and apprentice will rediscover their balance. Or perhaps they will be eaten. Such is the way of things.” This line is more of the attitude I expect from a creature between the light and the dark, but it is the only time the Bendu seems to be in the middle. I also don’t see Kanan’s logic of facing Maul without a plan. He justifies it because the fear of what Maul can do to their friends can cripple Ezra and Kanan, so they should just relax. To me, there is a difference between relaxing and winging it, and winging it almost gets Kanan killed. 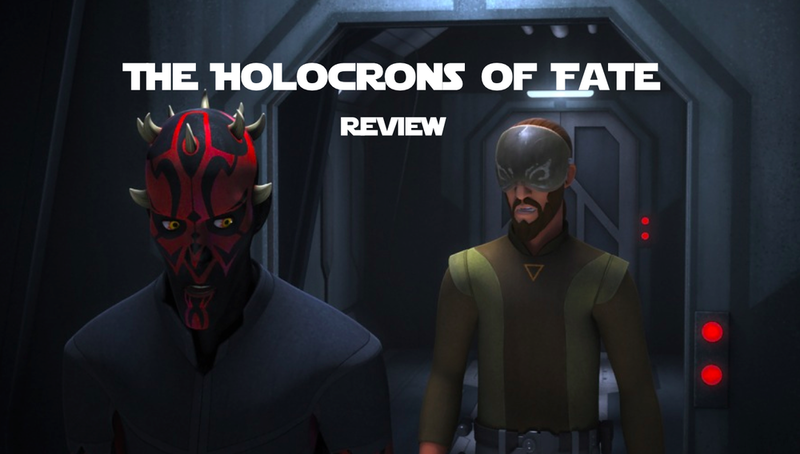 Overall, the episode sped through some issues just to let Maul get on someone’s trail. I liked it but I didn’t love it.